Cars are likely to have to be far cleaner than they are today to qualify for green incentives. The Straits Times understands that the Government is reviewing the Carbon Emissions-based Vehicle Scheme (CEVS), which currently dispenses rebates or surcharges according to how much carbon dioxide (CO2) a car or taxi emits. The revised scheme is likely to measure other pollutants emitted, such as nitrogen oxides, hydrocarbons and particulate matter. It could kick in as early as July 1, when the current scheme expires. September and diesel models from January next year. The CEVS revision is likely to affect diesel vehicles most. Although they produce less CO2 than petrol equivalents, diesel engines tend to emit more nitrogen oxides - which are harmful to the environment and can also lead to serious health issues - and particulate matter. The Land Transport Authority and National Environment Agency would not provide details when asked about the review. In a statement, they said: "We are in the midst of reviewing the scheme and will share more details when ready." Observers said the impending change could be why taxi companies such as ComfortDelGro and SMRT have been ramping up their fleet of petrol-electric cabs. Mr Neo Nam Heng, chairman of the Prime group of companies which runs Prime Taxi, noted that in 2009, it was the first cab company to use hybrid cabs. "Diesels have good CO2 levels, but their NOx (nitrogen oxides) and PM (particulate matter) are a real problem," he said. This is why a number of cities, including Paris, Mexico City and Madrid, are planning to ban diesel vehicles, he added. Mr Neo, who is also adviser to the Automobile Importer and Exporter Association, said incentives like road tax exemptions should also be considered for petrol-electric hybrid commercial vehicles such as vans and lorries. 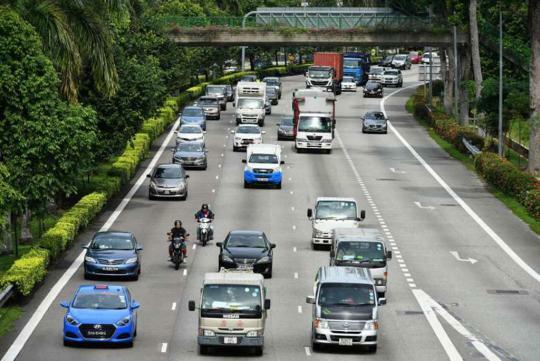 Mr Neo pointed out that these commercial vehicles, which are mostly diesel-driven, account for nearly 60 per cent of Singapore's total pollution from vehicles, even though they make up only around 30 per cent of vehicles on the road. Motor Traders Association president Glenn Tan said moving away from a carbon-centric scheme is "the way to go". "It is better to have a balance of various pollutants, rather than focusing just on CO2, which can be one-sided," Mr Tan said. "Because the net effect is that you are trying to reduce pollution on the whole." Mr Clarence Woo, executive director of the Asian Clean Fuels Association, said moving towards a scheme which considers various other pollutants is good news. "CO2 causes global warming, even though it is not strictly a pollutant," Mr Woo noted. "So the focus has been on having more efficient engines, which reduces CO2, and indirectly reduces other pollutants. But I think we have to deal more directly with these other pollutants."